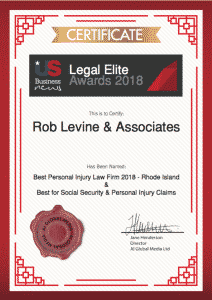 Best Personal Injury Lawyer: Providence Personal Injury Attorney and Social Security Lawyer Awarded 2018 Legal Elite. Rob Levine & Associates have been recognized by the US Business News 2018 Legal Elite Awards for their excellence in their field– dedication to their clients and their overall outstanding results of their cases. This is the business’ third year receiving Legal Elite Awards, and the firm continues to strive for the success of their clients. US Business New reports, “these awards highlight the most respected lawyers and attorneys as well as their fields of expertise and the companies they represent, and focus on the incredible results that come of commitment and passion in the industry”. Rob Levine & Associates have been named Best Personal Injury Law Firm of 2018. They have also been awarded Best for Social Security Claims and Best Personal Injury Claims. “It is an honor to receive these awards from US Business News. We are appreciative of the recognition and also want to acknowledge that it is our clients we win cases for each day that truly measure our success”, states head attorney Rob Levine. Rob Levine & Associates are personal injury attorneys who help individuals who have been injured in an accident or who are disabled. The firm services Rhode Island, Massachusetts, and Connecticut on injury cases. They also handle social security disability and veterans’ disability cases on a national level. The law firm is committed to their clients in all sectors of their practice and is devoted to continuing to be the best personal injury lawyers. Their Free Fee Policy guarantees that there will be no fees unless they win your case. This is yet another added benefit clients receive when working with Rob Levine & Associates. Rob Levine and Associates are personal injury attorneys helping individuals who have been hurt in an accident. The firm practices law and services Rhode Island, Massachusetts, and Connecticut on injury cases. Rob Levine and Associates also handles social security disability and veterans disability cases on a regional and national level as well. Our team is available 24/7 to help you. Contact us at 800- 742-3940 or visit our website for more information.